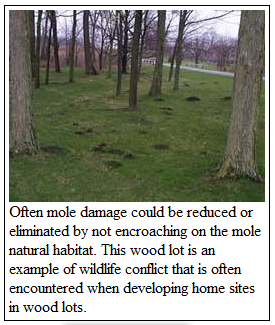 Mole activity can also cause considerable damage to lawns usually in the form of tunnels and/or mounds in lawn that can be unsightly, disturb root systems, and provide cover or travel lanes for other small mammals. On large properties mole activity may move from one part of the lawn to another. This movement is affected by climate and ground moisture. 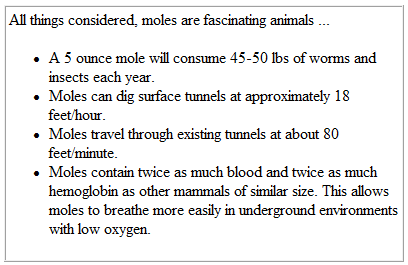 Moles will respond to changes in food supply as different insects become available in different places and at different times throughout the year. If disturbed, moles may temporarily leave an area but will usually return when you least expect it. Even without disturbance mole activity may last only a week or two in a particular area. This here-today, gone-tomorrow behavior is probably the root of most of the misconceptions that make some home remedies and pesticides appear credible. Over-watering your lawn can bring soil invertebrates and moles closer to the ground surface, making tunnels more visible. Reducing the amount or frequency of watering may help temporarily. Reducing the amount of turfgrass on your property will also reduce the visible signs of damage. In the long run, converting lawn to gardens, paths, hedgerows, or other more natural habitats can save you time and money as well as provide habitat for beneficial birds and butterflies. Numerous home remedies have been used, but results are inconsistent and generally ineffective. 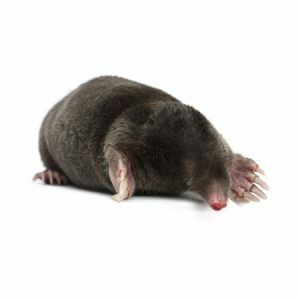 Remedies such as pickle juice, broken glass, red pepper, razor blades, bleach, moth balls, rose branches, human hair balls, vibrators, ultrasonic devices, castor bean derivatives (Castor Oil), and explosives may relieve frustrations, but they have little value in controlling moles and may harm you or the environment. Furthermore, certain chemicals or explosives are illegal to use. Trapping is the most effective and practical method of mole control. In general, trapping success is greatest in the spring and fall, especially after rain. 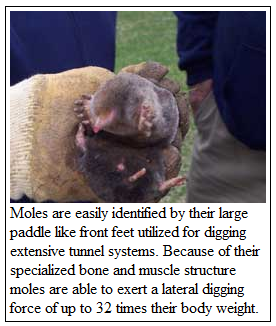 In the summer and winter, moles are active in deep soil and more difficult to locate.